Its 7 a.m. and the Middle-Eastern sun has just started chasing back the mist covering a line of mine-resistant, ambush-protected vehicles. American flags wave and snap from the vehicles’ antennas, while idling engines hum with a consistently deep timbre. A platoon of infantry Marines with India Company, 3rd Battalion, 4th Marine Regiment, attached to Special Purpose Marine Air Ground Task Force Crisis Response-Central Command, mill around their assigned armored trucks, waiting to start their day. Today is motor stables—a kind of “field day”—cleaning and maintenance for the platoon’s trucks. The Marines inventory equipment, chip away layers of hardened mud from tire wells, identify mechanical issues and ensure the vehicles are ready for employment at a moment’s notice. One of the trucks has a suspected brake issue, which has to be resolved before the next patrol goes out. But since none of the Marines with India Co. are certified mechanics, they bring issues to the attention of U.S. Marine Corps Sgt. Naomi Polumbo and her team. A few hours later, the truck is repaired and back in its assigned spot amongst the vehicle lineup. Polumbo is a motor transport mechanic with Combat Logistics Detachment 34, temporarily assigned to India Co. for more than two months working as a mechanic and is a leader of the wrecker recovery team. 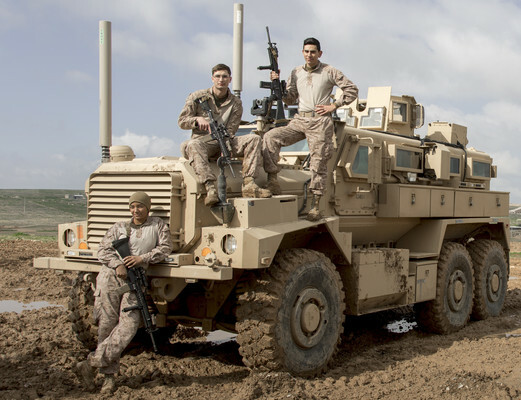 Operating with one Medium Tactical Vehicle Replacement wrecker, her team is responsible for lifting and towing armored vehicles such as the MRAP and mine-resistant, ambush-protected all-terrain vehicle. Prior to this, Polumbo served at Marine Corps Base Camp Pendleton, California with 1st Maintenance Battalion. If that seemed far from her small hometown of Hopewell, Virginia, the distance pales in comparison to the 6,643 miles now between her and home. But the distance doesn’t bother her too much,because Polumbo volunteered to deploy, and she’s working in a field that she’s enjoyed for many years. Upon graduation from recruit training and Marine Combat Training in 2015, Polumbo attended the three-month long Motor Transport Mechanic School at Camp Johnson, North Carolina and discovered there’s a distinct difference between being a Marine Corps’ motor transport mechanic and working on cars back home. After Camp Johnson, Polumbo learned new skills and trained with her fellow mechanics in Camp Pendleton. When the opportunity presented itself to deploy, she took it without hesitation. A goal that she has accomplished in more ways than one. Polumbo volunteered to deploy with SPMAGTF-CR-CC, but didn’t realize how often her team would be called upon to assist operations. Although the mechanics of CLD-34 went through rigorous training prior to the deployment, the austere environment offered a fresh set of challenges; fewer resources and limited spare parts to make repairs. “I love the independence and knowing that I’m doing my job in a real-world setting,” said Polumbo. That setting required that the mechanics operate in ever-changing conditions – including outside the camp. When a vehicle became inoperable during a convoy, it was up to them to get the crew and asset back safely. In addition to an unfamiliar environment, she’s also one of only two female Marines embedded with India Co. This has added yet another facet to her experience; a positive one. Polumbo and her team have become essential to India Co.’s mission by more than a means of vehicle recovery. They are treated as members of the India Co. family. Polumbo, CLD-34, and India Co. have completed many patrols in the Middle East. Even though she’s unsure of what the future has in store for her, Polumbo acknowledges that after this experience, re-enlisting is still on the table.